Christmas is over, the weather is miserable, and January is traditionally time for everyone to start thinking about holidays. British Banter is delighted to recommend the perfect partner for all your 2019 holiday/vacation needs. 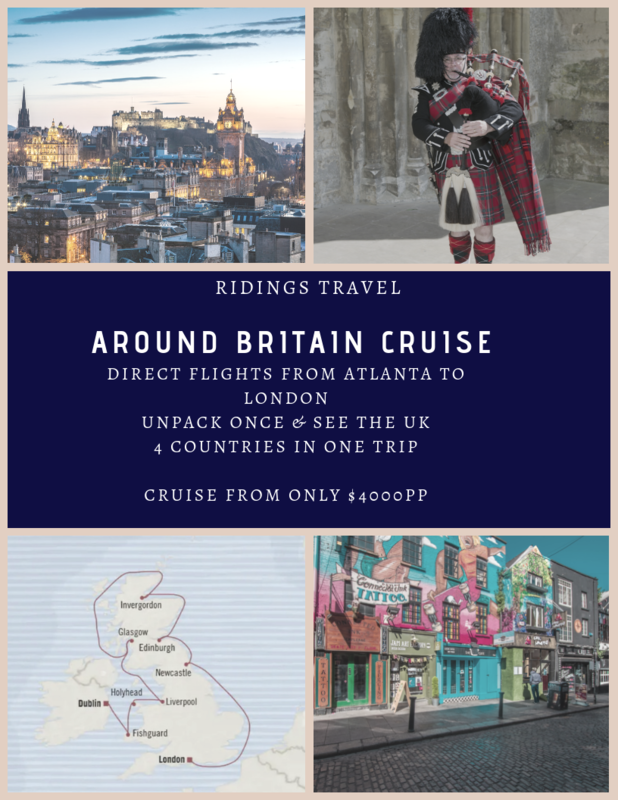 Whether you are planning a flight from Atlanta to the UK, a sightseeing tour of London, or even a hop this way across the pond to gallivant around Georgia (scroll down for our top tips), Ridings Travel will find the best deals and design the perfect itinerary just for you. Owners Mike and Gerry bring a wealth of experience from 20 years of travelling the world. Mike flew with British Airways for 12 years as cabin crew on long-haul trips, and more recently with executive clients on luxury private jets. ​He has a life-long passion for travel and loves to share his experience with his clients. As a keen cyclist, Mike is an expert in specialist cycling holidays as well as a qualified cruise consultant. 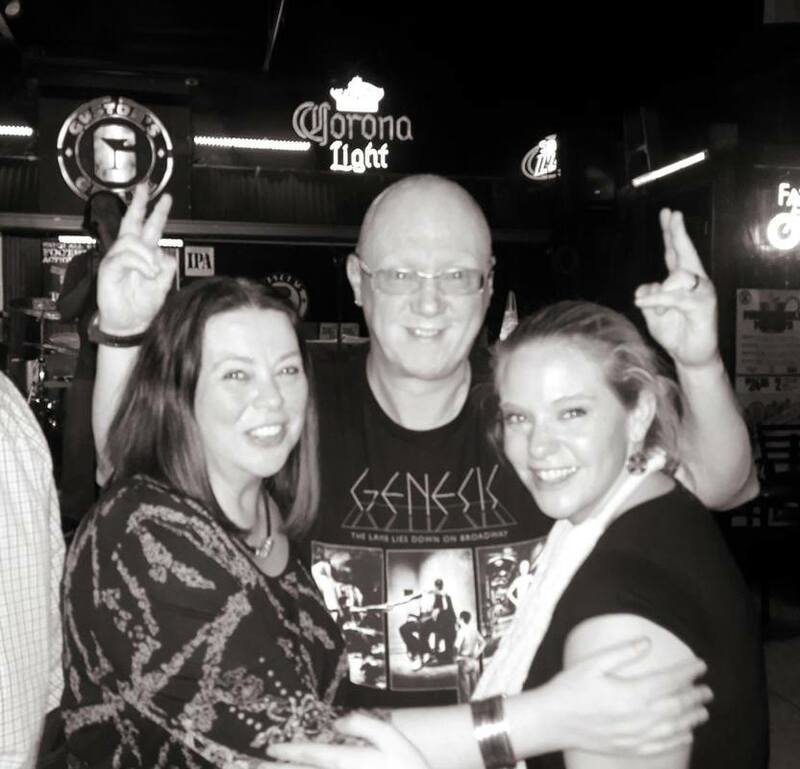 Gerry’s background is in corporate management and he is also extremely well travelled. He is the ski expert at Ridings Travel and he specializes in luxury and spa holidays too. Mike and Gerry offer a personalized service tailored to your individual requirements. They even make home or office visits around Yorkshire, bringing their expertise directly to you. Their “Holidays from Home” parties and coffee mornings are a great way to explore different destinations from the comfort of your sofa, via virtual tours with 5D goggles. For clients further afield, Mike and Gerry can be reached by phone, email or Skype. They also arrange car rental, travel insurance, theatre tickets and airport lounge access to make every part of your trip complete. Ridings Travel is a totally independent organization with no targets or ties to particular companies, so you can trust their travel advice to be absolutely impartial. 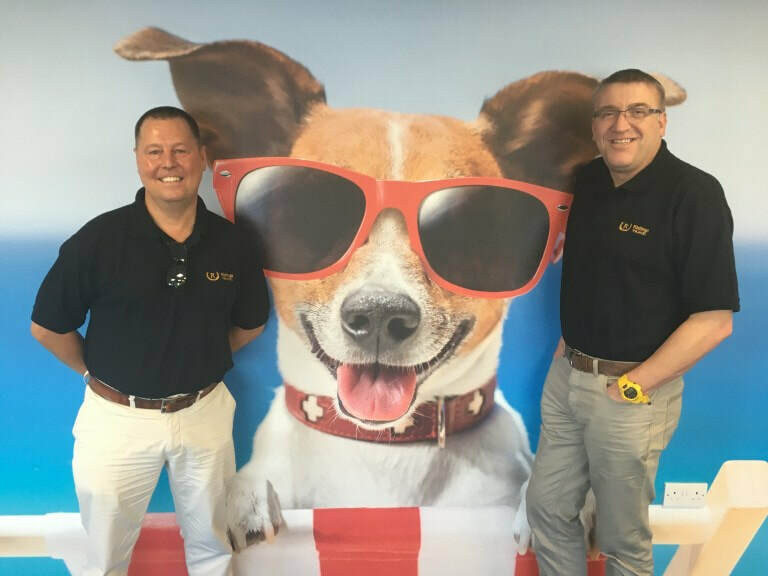 If you are looking for UK-based travel experts to make your next Brit trip brilliant, give Mike and Gerry a shout. 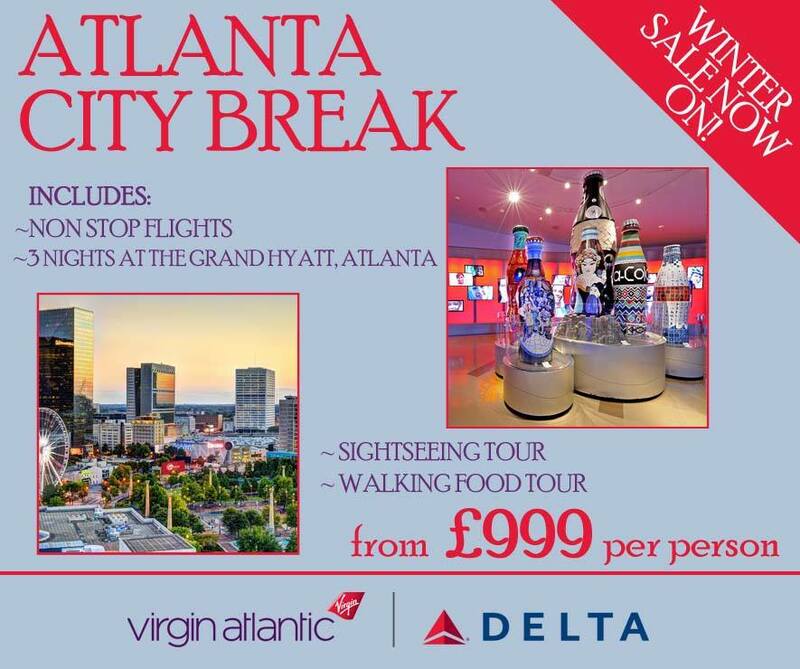 Or maybe you are a Brit interested in exploring Atlanta? 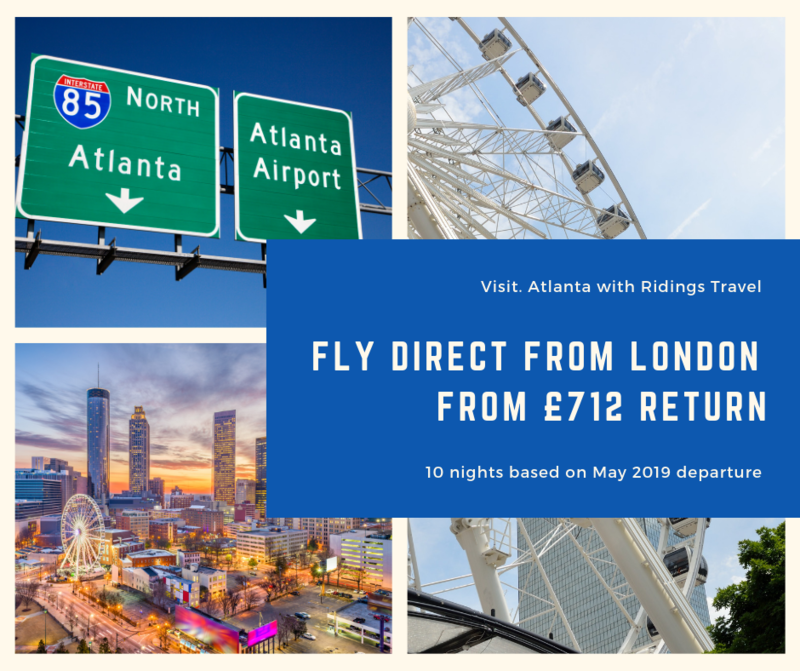 Ridings Travel knows just how to make your American dream come true; you’ll soon be Stateside, sampling life in the Deep South while feasting on fried chicken, sipping sweet iced tea and saying “y’all” in no time at all! 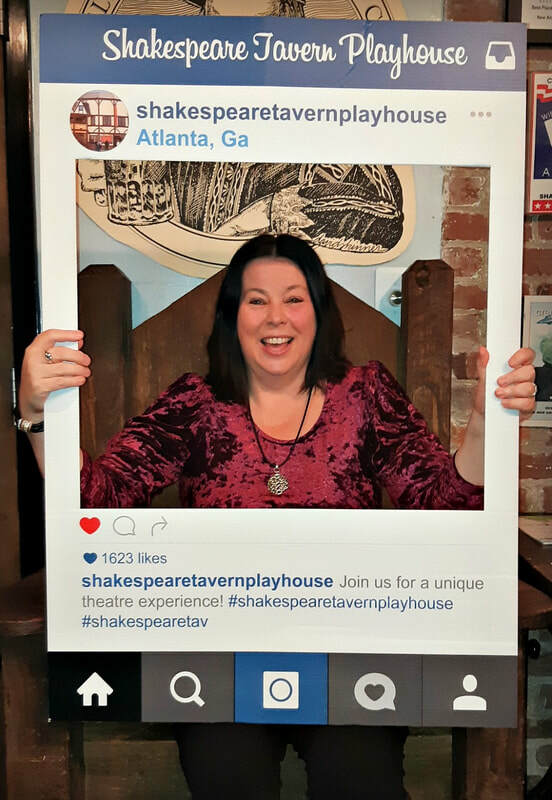 It must be more than 10 years ago when hubby and I (with our dear friends Barbara and Paula) first saw A Christmas Carol at Atlanta’s Shakespeare Tavern. 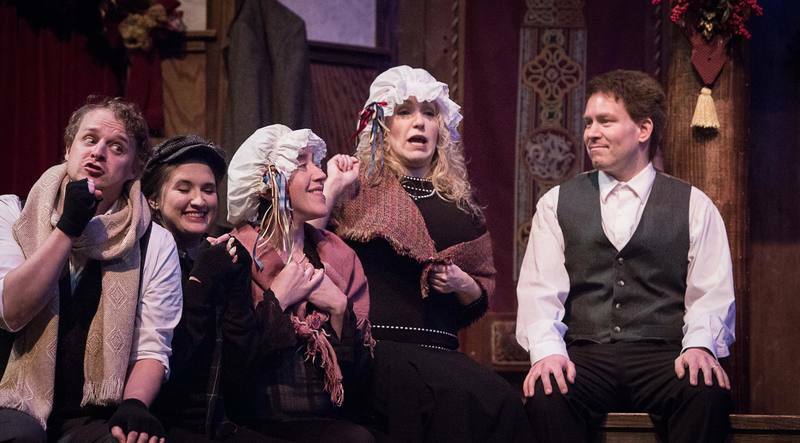 It has since become a festive favourite and an annual holiday tradition for us - Christmas just wouldn’t be the same without Ebenezer Scrooge, Tiny Tim and a trip to The Tavern. 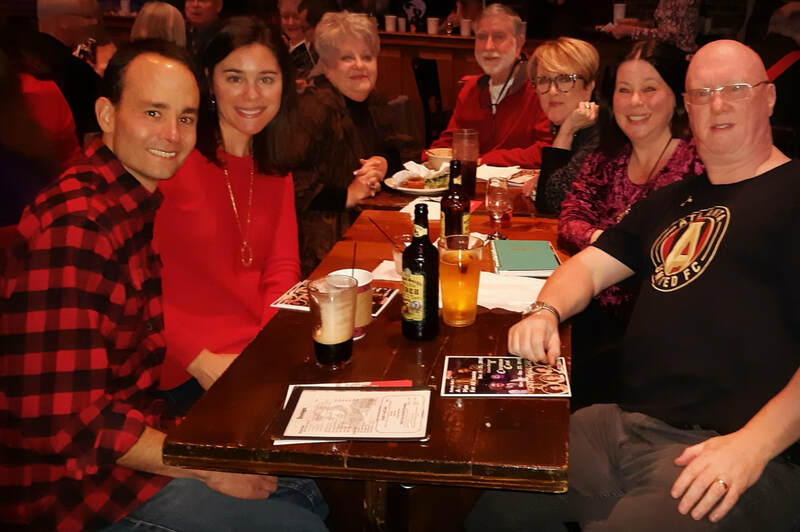 And so we met up with Barb, Paula, Billy, Jason and Jennifer at the Midtown theatre last weekend, excited to discover what new little twists on this timeless classic the ASC players had in store for us this year. We arrived early, ordered a drink at the bar (a seasonal, sparkling Poinsettia cocktail for me - thank you Jason), then headed to our table in front of the stage. 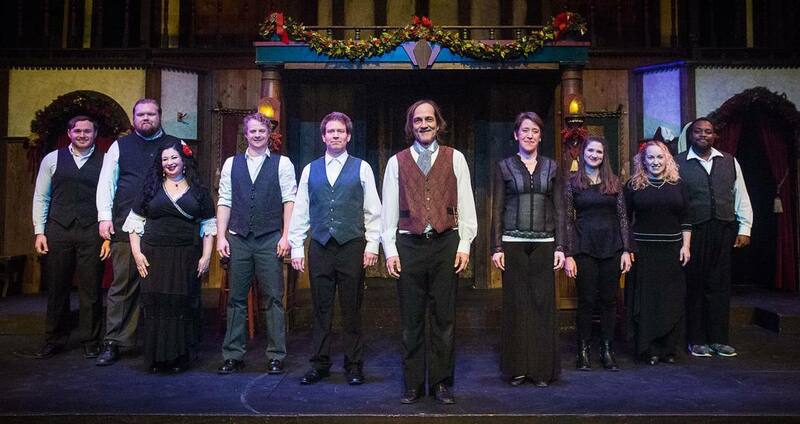 In authentic Shakespearean playhouse style, The Tavern’s atmosphere is always very relaxed and informal. British pub grub is available for purchase beforehand, and the audience is encouraged to continue casually munching on Cornish pasties and shepherd's pies while drinking pints of ale as the play begins. As the lights dimmed and voices hushed, we were suddenly transported across the pond and back in time to Dickensian London. 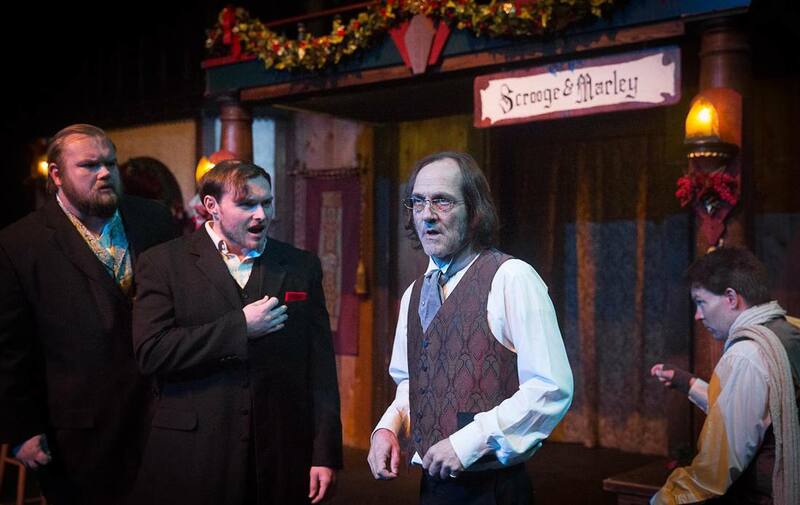 The Atlanta Shakespeare Company’s unique adaptation of A Christmas Carol is officially billed as a “storyteller’s version”, remaining true to the original detail and descriptive language of Dickens’ novel. The cast of ten actors alternate between narrating the story and playing the various characters. 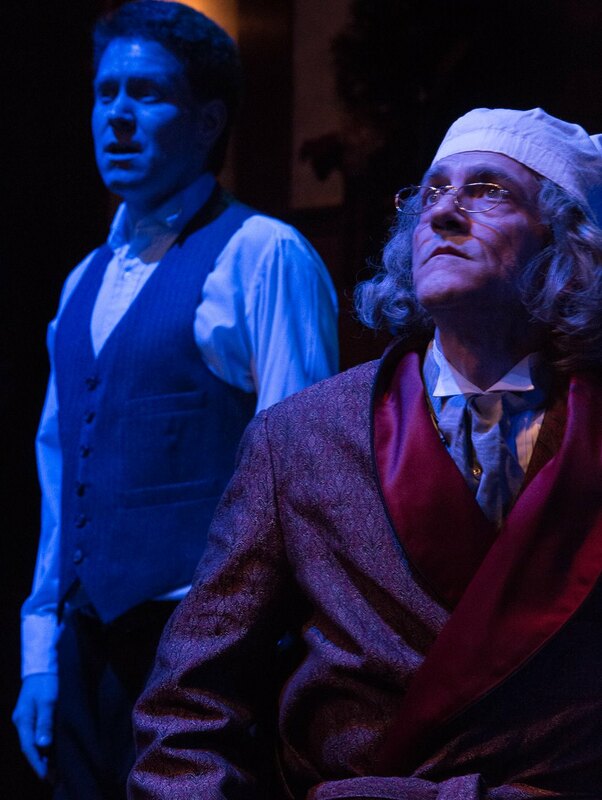 ​Although there are a few new faces each time we come, discovering that Drew Reeves has reprised his role as Scrooge once again always feels reassuringly familiar - a bit like seeing the same old (grumpy) friend every Christmas time. Paula was delighted to find her former fourth grade student Mark Schroeder (now all grown-up) playing Bob Cratchit for the third year in a row, and the lovely Becky Cormier Finch (who is also box office manager and so helpful when I’m making our annual booking) is a regular member of the ensemble, performing several different characters. 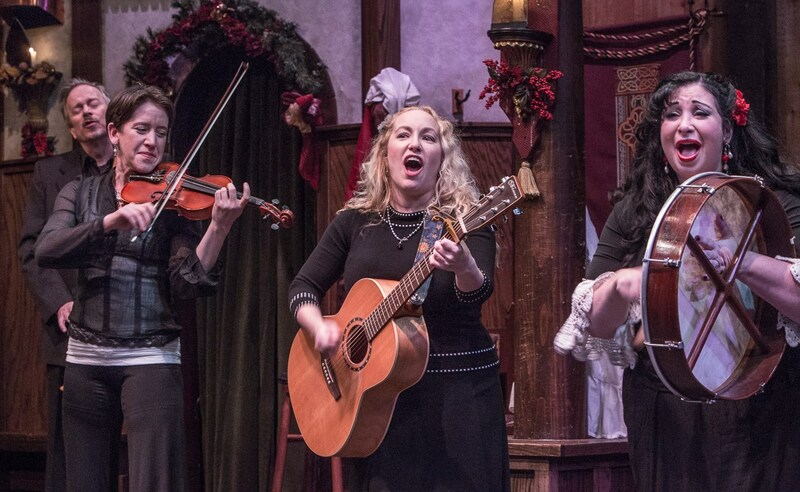 This version of the story includes live music too, with the talented actors also singing and playing violins, acoustic guitars and percussion instruments. Rather appropriately for a play with this name, there really are Christmas carols (Away in a Manager, God Rest Ye Merry Gentlemen, Good King Wenceslas, etc.) beautifully performed amidst the narrative. And enough passing references to mince pies, Christmas pudding and Camden Town to make a certain Brit feel quite nostalgic at this time of year. 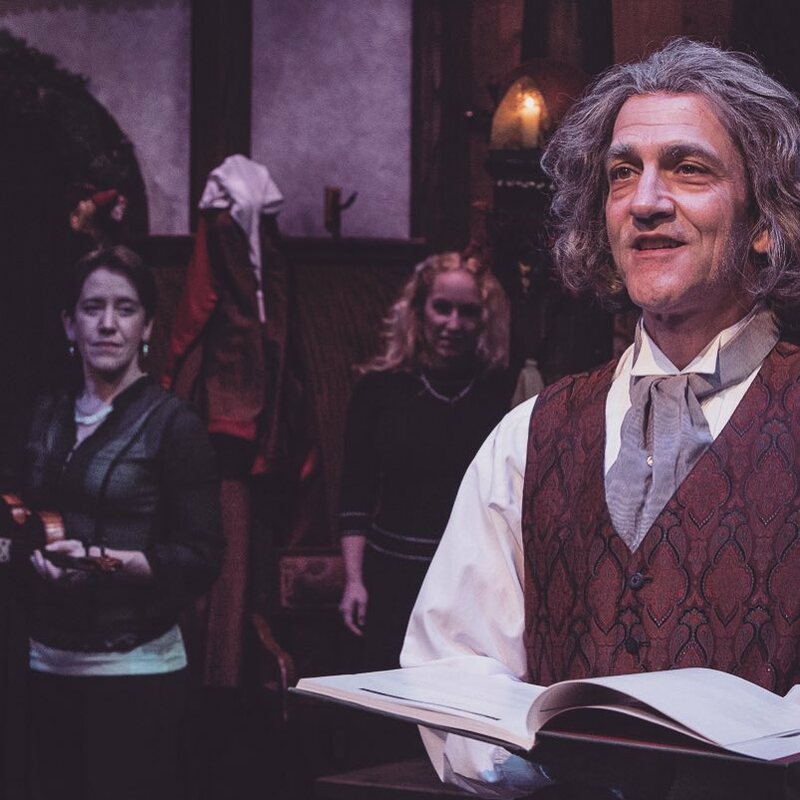 The Tavern is a small playhouse, intimate, cosy, and not stuffy at all, where actors (and ghosts) naturally interact with the audience throughout the performances. We were amused by an impromptu moment as Scrooge was moving amongst the tables and someone’s beer accidentally spilt over his shoes. The entire cast joined him (and all of us) in fits of laughter and spontaneous applause as he dried himself with a napkin before climbing back on stage, undauntedly still delivering his lines with a smile. 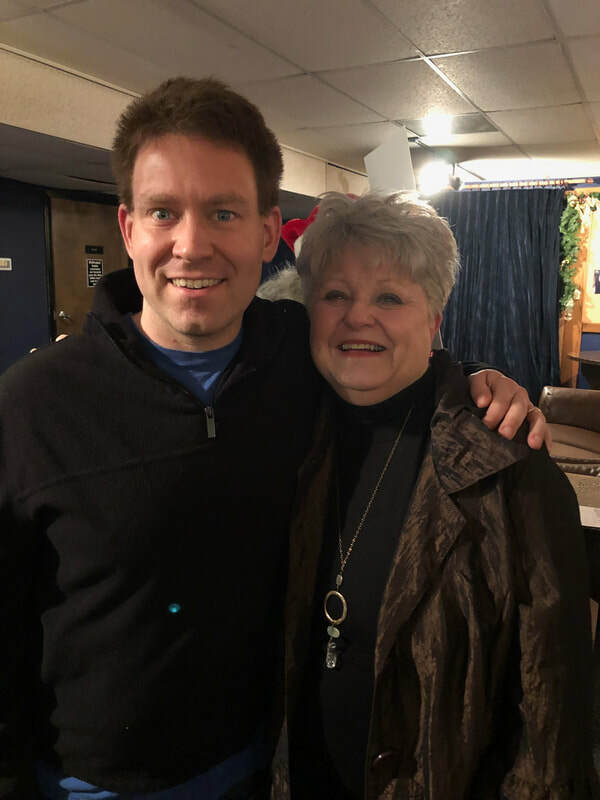 After the show, the cast took time to mingle with everyone in the lobby, and Paula got a chance to chat with Mark about old times and happy memories. 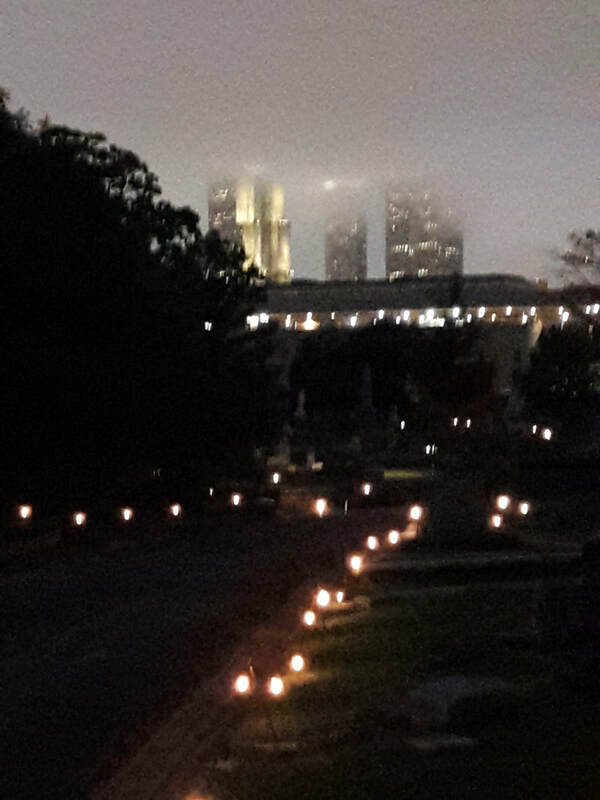 It was a rainy night in Georgia as we headed to Atlanta’s historic Oakland Cemetery with a group of friends just a few days before Halloween. Thanks to Myrna and Matt, we had tickets for The Spirit of Oakland tour which is immensely popular and sells out months in advance. 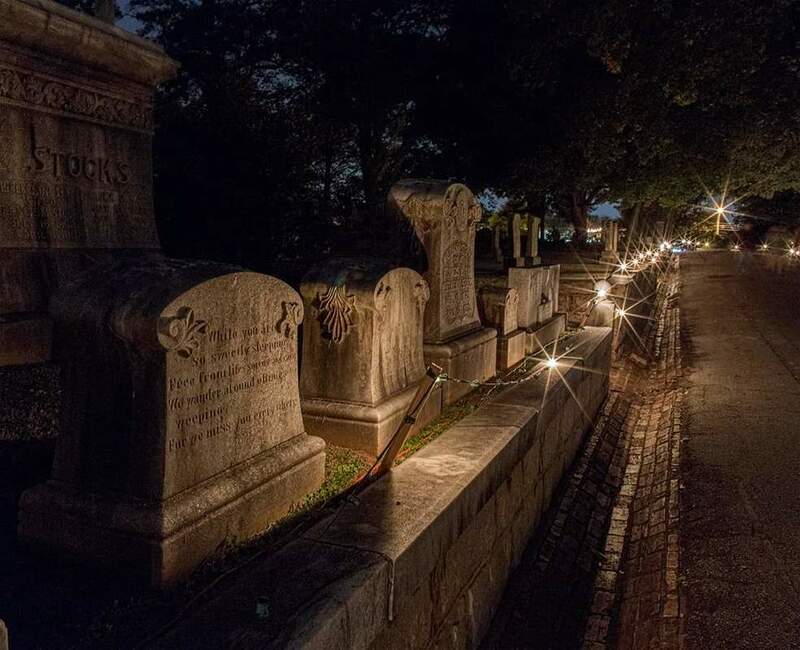 ​We were among a lucky few who ever get to experience the cemetery after dark while still alive. 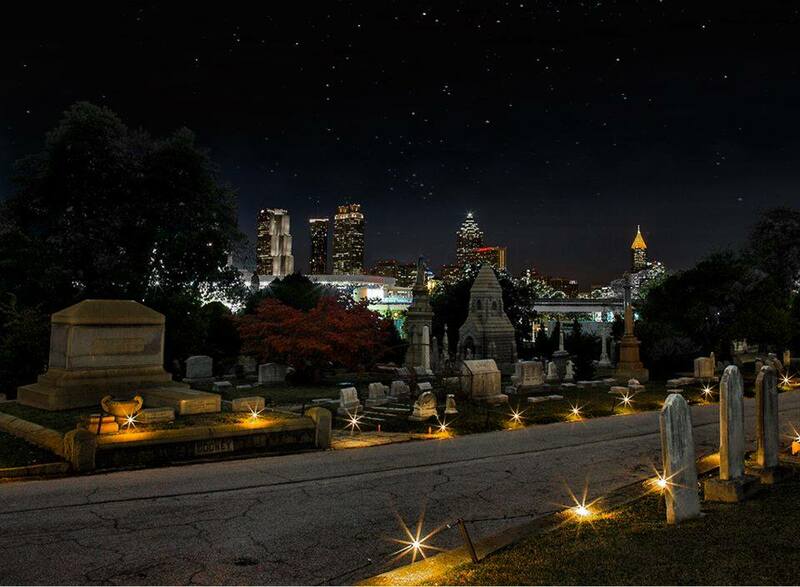 Established as a burial ground in 1850, Oakland Cemetery is the final resting place of many notable Atlantans including Gone with the Wind author Margaret Mitchell, and is still in use as an active cemetery today. Originally known as Atlanta Cemetery it was later named Oakland in honor of the many majestic oak trees growing there. On the night of our tour, all the trees were brightly lit in spooky colors, highlighting their beauty. ​This was mine and hubby’s first visit, and we were surprised at the sheer size of the graveyard. Reading a plaque at the entrance, we learned that during the Civil War Oakland expanded to 48 acres as more space was needed to bury soldiers from local hospitals and battlefields. Almost 7000 Confederate soldiers are interred among the 70,000 graves, and there were also separate burial sections for slaves and paupers. Our group gathered at the Bell Tower, cradling cups of hot chocolate with marshmallows to keep us cozy on a chilly night. The atmosphere was lively and quite spirited (excuse the pun). 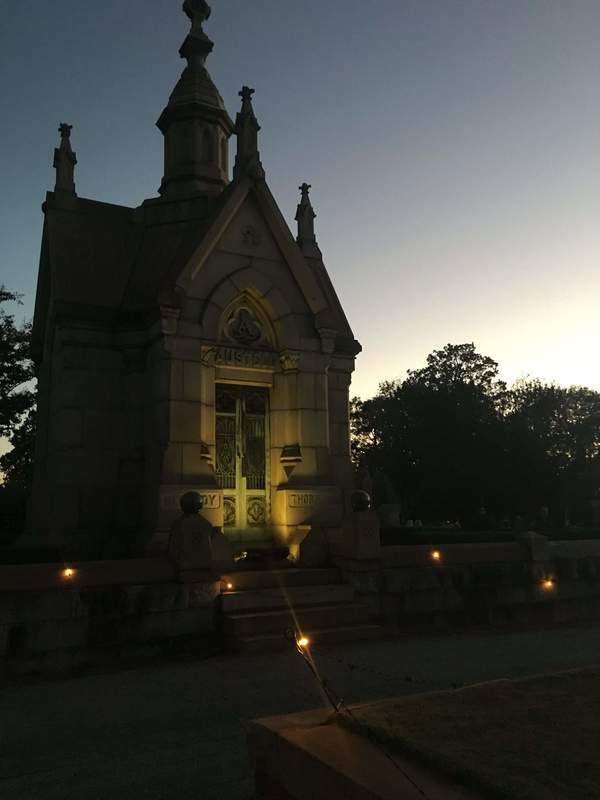 There was even live music from a trio playing jaunty tunes at the start of the tour, which began with an introduction from the Victorian-costumed attendant who guided us through the cemetery’s beautiful lantern-lit gardens. Along the way, we met several “friendly resident ghosts” (as opposed to the scary kind) who told us of their interesting lives before Oakland became their final resting place. This is so much more than a spooky ghost tour;The Spirit of Oakland aims to “enlighten not frighten” and the kids in our group (Nicolas, Isabella, Sydney, Samuel and Brooke) agreed that it was far more fun than freaky. 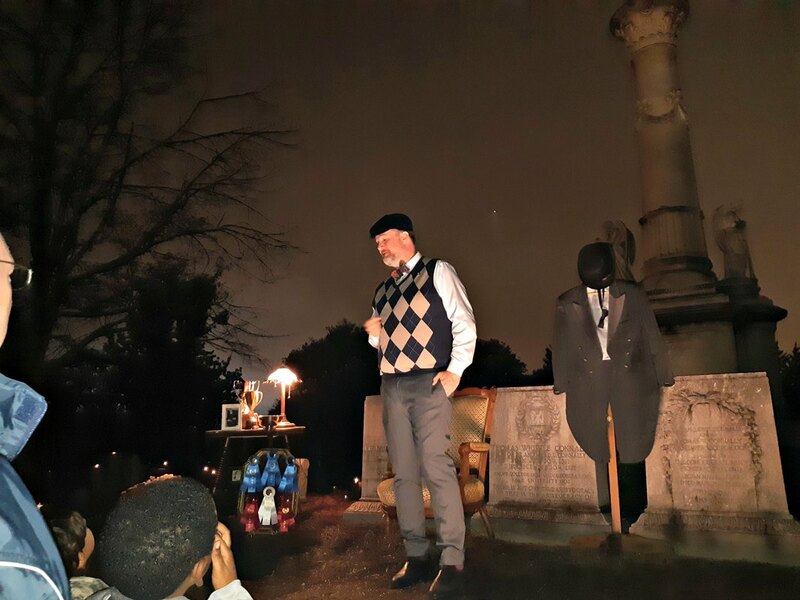 Strolling in the dark among crypts, mausoleums and tombstones, we were entertained by stories from beyond the grave as Oakland came to life. Standing boldly before her tombstone wearing a long skirt, wide-brimmed hat and a “Votes for Women” sash, Rebecca’s feisty ghost spoke of her life as a suffragette and campaigner for women's rights. A respected founder of the Atlanta Women’s Club, she told us how her reputation was ruined by scandal when she left her husband for another married man with “a wonderful British accent” (this raised a laugh from our group - no idea why!). Despite being shunned by polite society, she continued to fight for education, labor and health reforms until her death, just one year before American women finally won the right to vote. 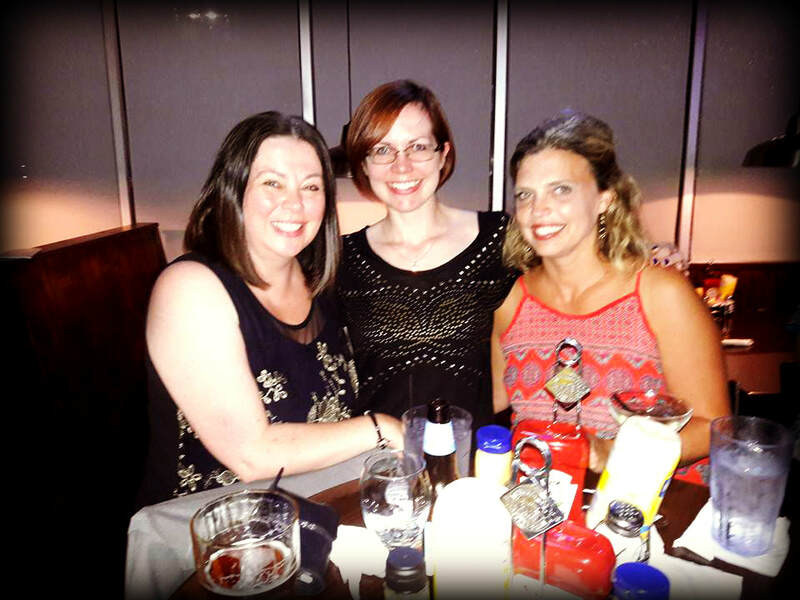 As we parted company, Rebecca’s ghost gave a sassy smile and reminded us of that famous saying: “well-behaved women rarely make history”. We met the ghost of Mrs. Lambert inside Oakland’s greenhouse as she was lovingly tending to some plants. She explained that, as the wife of the gardener who designed most of Oakland’s grounds, she often wanders from her grave near the front gate to check on the young trees and shrubs sprouting in the nursery. She feels a duty of care to the cemetery that continues beyond her lifetime. ​We also encountered two Victorian ladies in frilly crinoline dresses carrying pretty parasols. These ghosts explained that during the late 19th century, Oakland, with its winding pathways, elaborate mausoleums and neo-classical architecture, was part of the “rural garden” cemetery movement. In the Victorian-era, mourning customs became fashionable pastimes, and Oakland was a popular destination for carriage rides, Sunday afternoon strolls and even graveside picnics. Nothing strange or creepy about that at all. ​We found Henrietta and her husband James at their joint burial plot, next to a fancy sofa, tall fringe-shaded lamp and coffee table. They were setting out cups and plates ready for Henrietta’s monthly women’s literary circle meeting. She told us how both she and her husband were grandchildren of freed slaves who went on to attend university and dedicate their lives to the advancement of African-Americans in Atlanta. Dr. James was an esteemed dentist and president of the Atlanta Medical Association. He talked of how much he’d enjoyed playing the organ at church, as well as gently teasing his lovely wife. They seemed to be rather busy, so we left them to prepare for their ghostly guests. ​A lively storyteller, William’s ghost explained that he was briefly mayor of Atlanta for 60 days in 1853. He’s in good company at Oakland, he revealed, as he often bumps into his fellow former mayors (Maynard Jackson is a bit of a practical joker, apparently). A shrewd entrepreneur, William invested in the local railroad and cotton mills until the Civil War marked a shift in his fortunes and his loyalties. He told us stories of entertaining General Sherman at his home, and how he will be eternally remembered as either a staunch Confederate or a Union sympathizer, depending on who you choose to believe. All too soon it was time for us to return to the land of the living and allow the Oakland residents to resume their eternal rest. ​It was an enjoyable night of spirits, stories, surprises, and just a small taste of all that this historic place has to offer. there is so much more to see, and special events all year round. 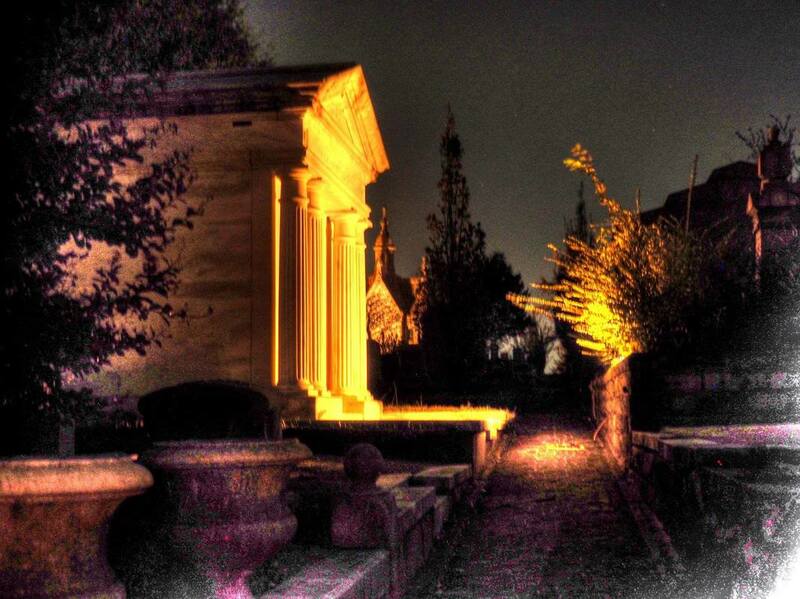 ​Oakland Cemetery is not just for Halloween. World of Coca-Cola and the Georgia Aquarium. But did you know about the abandoned railroad track that’s become a tranquil trail for joggers, hikers and cyclists? Or that “Hotlanta” has its very own snow village? 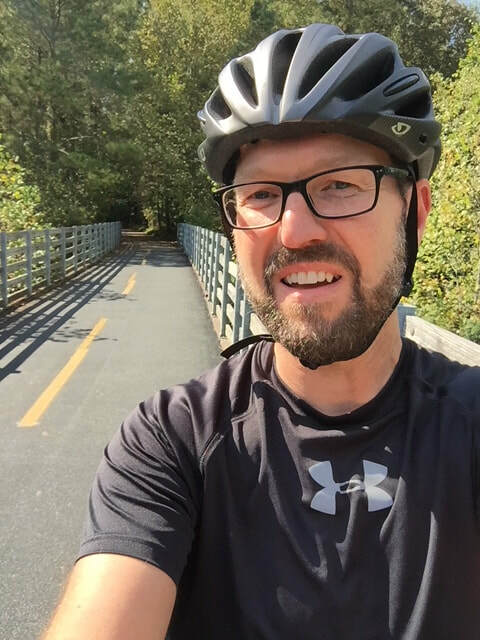 “One of my family's favorite places in the Atlanta area is the Silver Comet Trail. The former railroad line is situated 13 miles northwest in Smyrna, and runs 61.5 miles west to the Georgia/Alabama border, near Cedartown. The paved trail is open to cyclists, walkers, rollerbladers and dog walkers, and is also accessible to wheelchair users all year round. 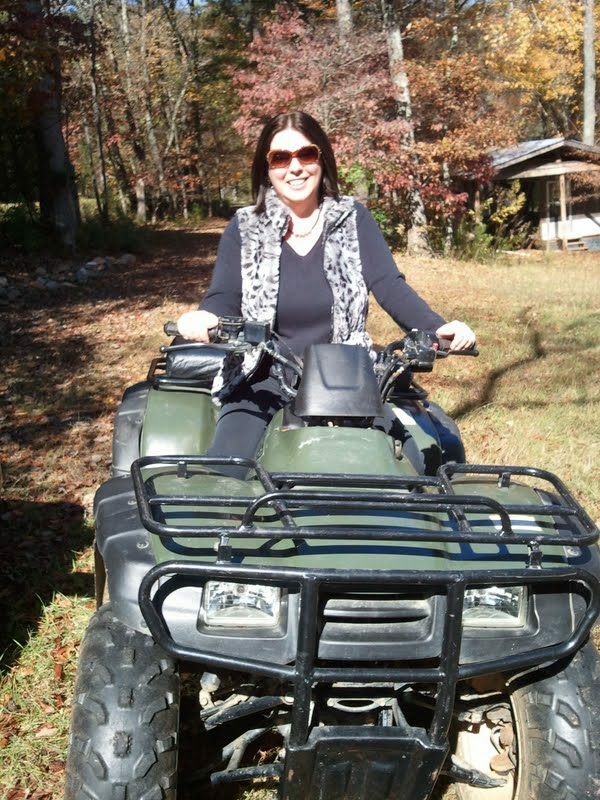 Motorized vehicles are not permitted, though you do need to take care of other trail-users travelling at varying speeds (and the occasional snake sunning itself in the sun! ), particularly on busy summer weekends or holidays. “My decision to buy a house in East Atlanta in 2002 was strategic to enable the continuation of that very British pastime of 'a walk down the pub'. ​and downhill all the way! 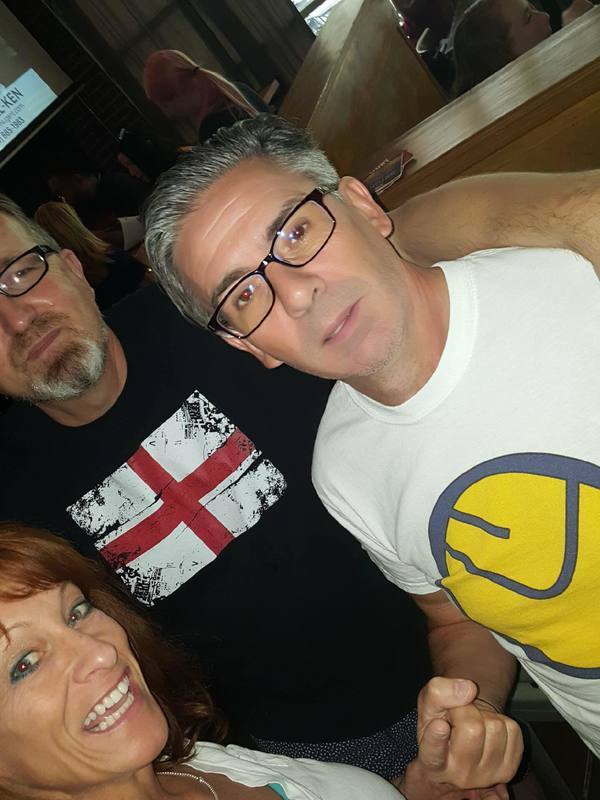 Introduced to me by my fellow expat Mark Hutton, we were tasting beer there before the venue was built out or even had a 'bar'. 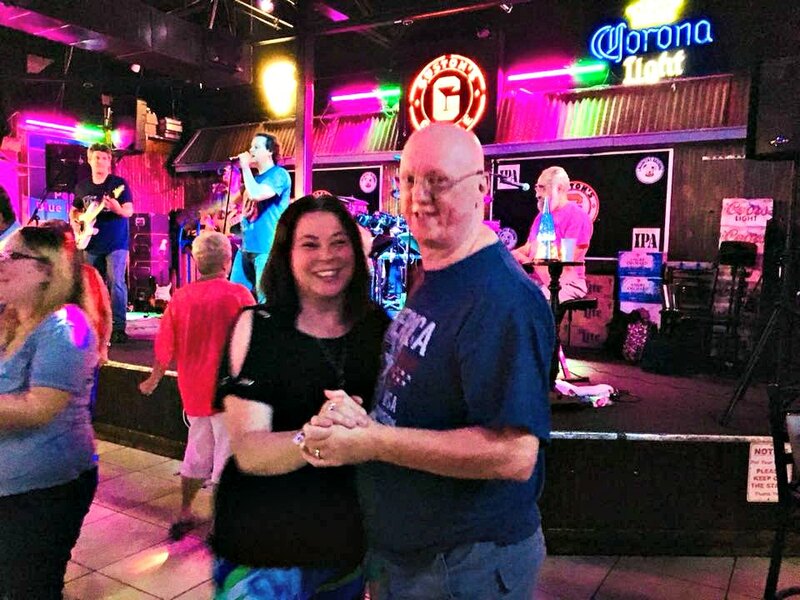 Mark and his wife Chevonn were the first couple to be married at the brewery. ​The space is very low key with local art adorning the walls; a small semi-private space, with a shuffleboard and a couple of dartboards. Food is provided on occasions by food trucks, but you are welcome to bring along a pizza or take out. The beer garden looks out across to the Atlanta Police Department Mounted Patrol horses. The beers are excellent with at least 8 choices at any one time and seasonal rotations. They have even installed a beer engine and are producing cask ales to be hand-pulled. 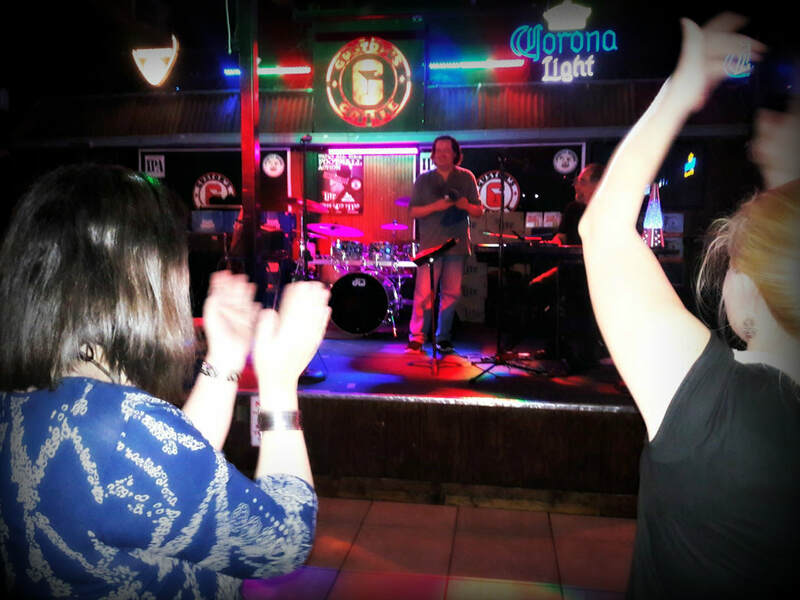 The owners and bar staff are a cut above; friendly, attentive and passionate about what they do. 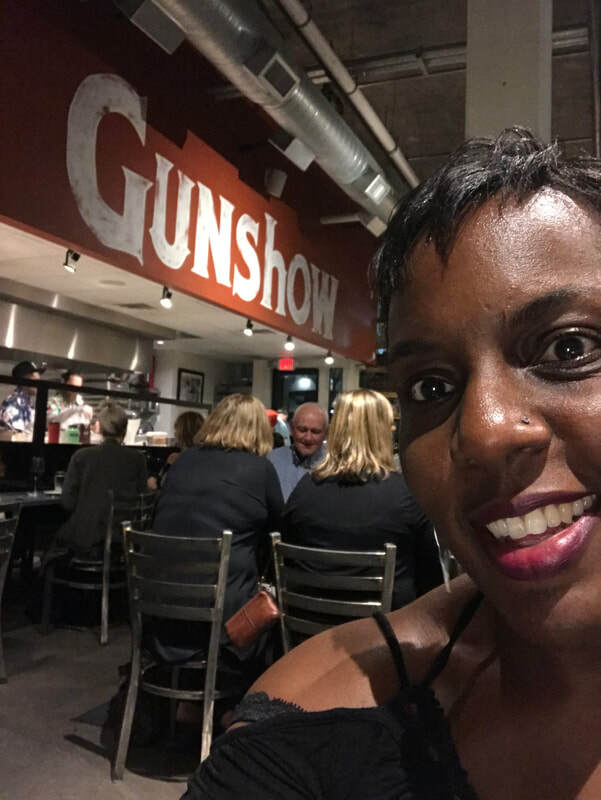 “Gunshow is one of my favorite restaurants in Atlanta. 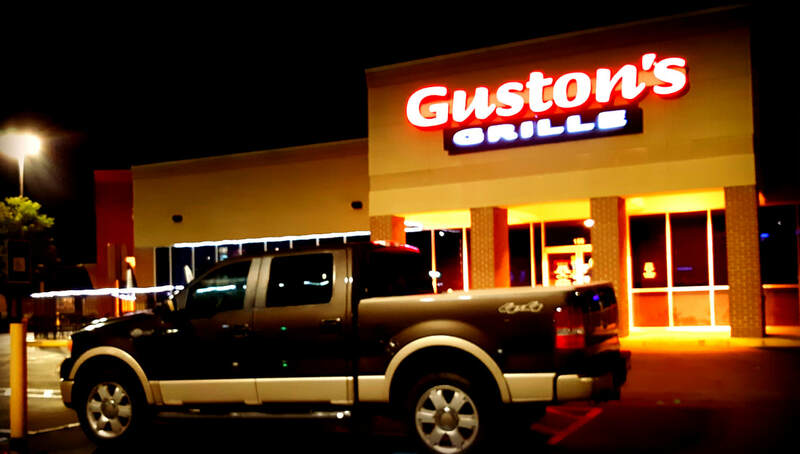 You never know what's on the menu until you turn up, as it changes every day. A variety of dishes are cooked, and the chefs come to your table with food on a cart to ask if you want their dish. If you refuse you may not see that dish again. It’s a great concept for trying lots of things .... kinda like tapas! I-75 is the most varied stretch of river for many miles, with deep stretches separated by rapids. The Acker’s Mill section includes the cliffs of the palisades and jumping rock where you can jump from heights of 20’ or more into an equally deep river. You are likely to find me there early in the morning when the mist is still heavy. 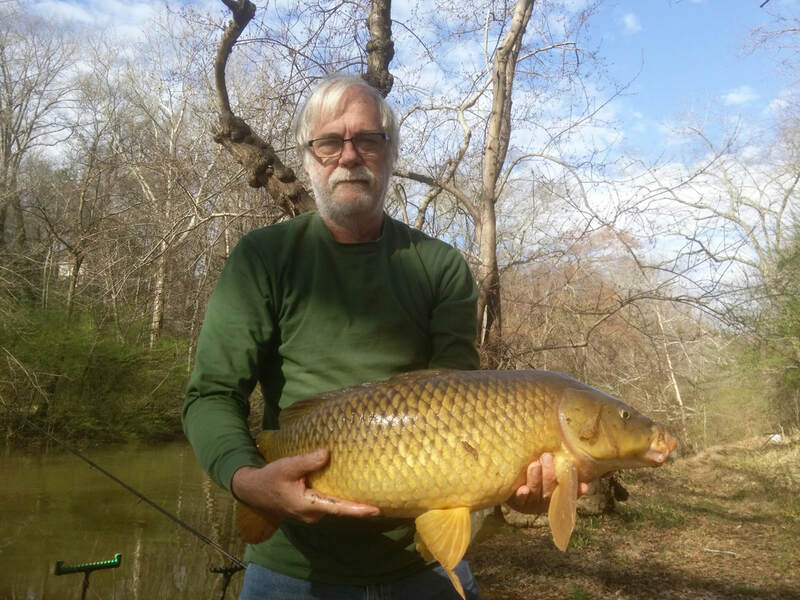 I will be there for the fish as this stretch holds carp, catfish and striped bass in excess of 20lb. 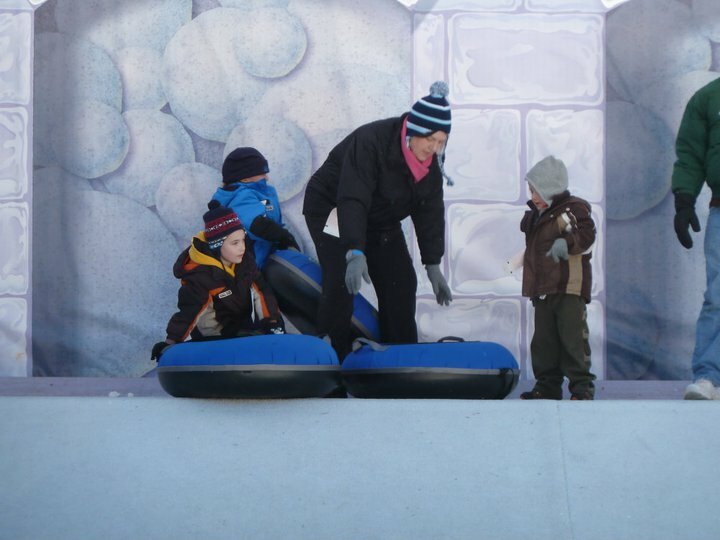 “Stone Mountain Park is great fun for families! We bought a Stone Mountain pass, which also includes parking. We’ve had that for several years. It includes the train ride and the cable car ride. There is also a big barn full of slides, ladders, tunnels, rope bridges, soft foam ball cannons/guns; it is three stories high - my children love it. There's a place for the adults to sit inside at the bottom, with only one way in and one way out, so it is safe. 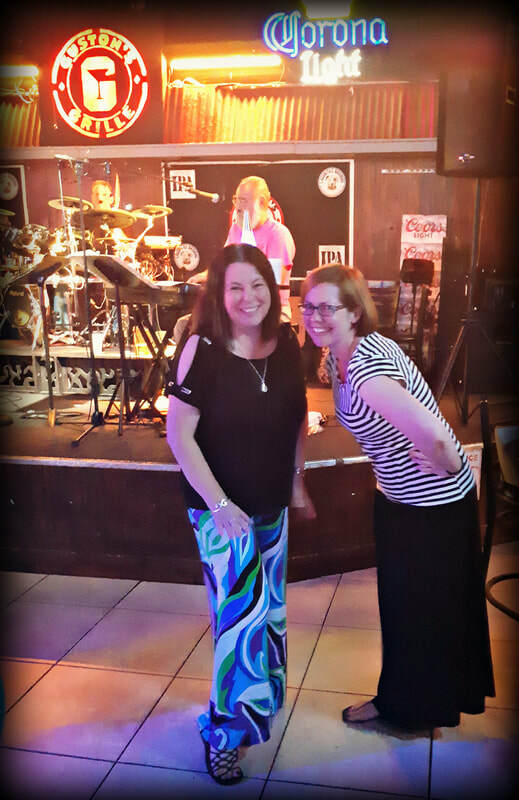 great atmosphere, good food and lots of live music. ​by the brilliant Michael Allen Radio Show band. ​make the band sound twice as good!". 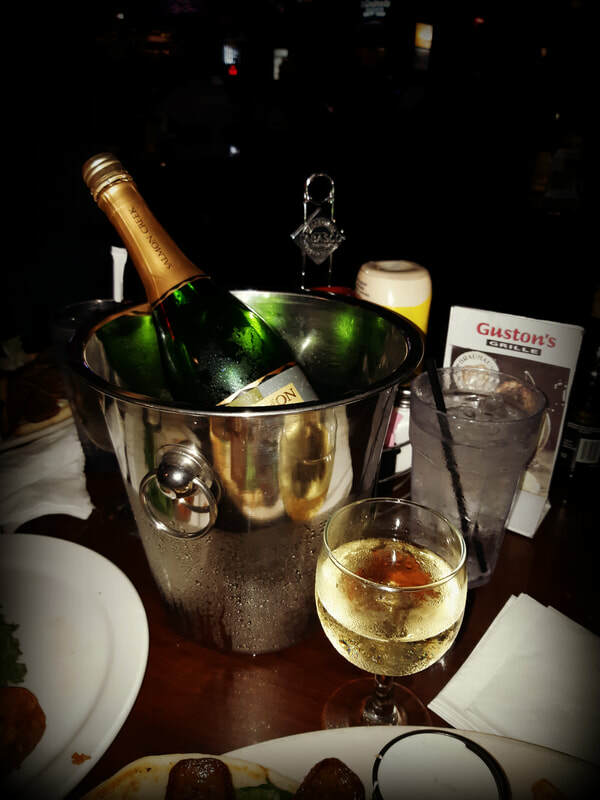 Ladies Night - even the champagne is half price!